LAKE BUENA VISTA, Fla. — Disney is getting closer to fulfilling every "Star Wars" fan's dream: a real-life immersive "Star Wars" experience. At a special event on May 27 at Disney's Hollywood Studios, the team behind the project regaled visitors with new details on the upcoming expansion to Disney World set to open in 2019. Actor and mega "Star Wars" fan Warwick Davis was on hand to welcome attendees and introduce a special panel devoted to the largest single land expansion Disney has attempted yet — "Star Wars: Galaxy's Edge." Davis has since played numerous roles in the "Star Wars" universe, but that first experience of walking on set, playing a part and even battling Stormtroopers left a lasting impression, he said. Like many fans of the iconic space saga, he dreamed of being immersed in a real-life "Star Wars" experience. And he was. That is, until the director would call cut. "When you're on Batuu [the setting for 'Galaxy's Edge'], no one is going to say, 'Cut,'" Davis told an excited audience at the event. "It's the immersive experience that you're absolutely going to love". 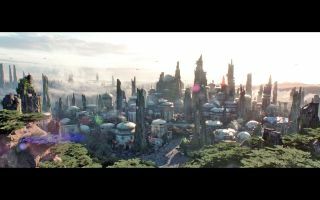 The planet Batuu, nestled in the "Star Wars" galaxy's outer-rim territories, is a temperate, forested world. It is known for the many petrified trees scattered on its surface. Visitors to the Disney attraction will spend their days in one of the largest outposts in "Star Wars" lore: Black Spire. "We want to make this a believable place," Margaret Kerrison, the managing story editor for Walt Disney Imagineering, said at the event. "There's a reason why it's named that [Black Spire]. Thousands and thousands of years ago, these trees eroded and petrified and are now used as way-finders for travelers." Disney representatives said that this not just another "Star Wars" story, but a place for you to find your "Star Wars" story. Now, for some exciting new details: Black Spire, as we know, is a spaceport. This means (cue the inner squealing) there are spaceships — yes, as in multiple spaceships that guests will be able to board — including none other than the Millennium Falcon. According to the group of Imagineers (the brains behind Disney's theme park projects) on the panel, approximately 5,000 people worldwide are working on "Galaxy's Edge." Disney is working alongside the United Kingdom's Pinewood Studios to not only film the next "Star Wars" movie, but also work on the new "Star Wars" land. "Nobody puts 'Star Wars' on screen better than those folks," said Scott Trowbridge, portfolio creative executive for Walt Disney Imagineering. "We're not just putting it on screen, though — we're bringing it to life, for reals." The studio is helping Disney build not one, but two complete, full-scale AT-AT (all-terrain armored transport) vehicles. Imperial ground forces use the giant, four-legged combat vehicles to mount attacks against the Rebellion. Baker explained that in the films the vehicles are typically inserted as a digital effect, so no one's ever thought about building a full-size version until now. Rumor has it that these two AT-ATs will play a role in the land's second big attraction, which also happens to be another spaceship. In addition to the Millennium Falcon, Disney is building a resistance troop transport ship. Both vehicles are actual, full-size spaceship models that guests will board for adventures. Disney revealed that there would be more than just two spaceships in the land but did not disclose any details on what the other ship (or ships) might be. As with any Disney village, there will also be some epic shopping outlets, including a special creature stall where guests will be able to interact with and purchase some of the unique beings from the "Star Wars" universe. The imagineers said that some of these creatures, like Loth-cats from the animated series "Star Wars Rebels," have never been featured in the films. "We're touching on books, movies and animated series to bring you some unique creatures," Eric Baker, creative director at Walt Disney Imagineering, said during the event. While we still don't have a firm opening date for the attraction, Disney revealed that "Galaxy's Edge" will come to Disneyland in Anaheim, California, in the summer of 2019, followed by Walt Disney World in Orlando, Florida, later that fall.